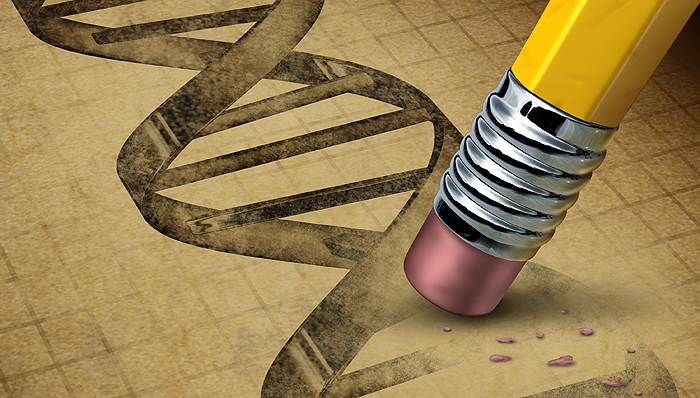 Gene therapy has been repeatedly hailed as a “solution” for numerous eye conditions. But how close are we to see it being used in reality? Radhika Holmström reports. “First results in gene therapy trial for inherited blindness,” announced the Wellcome Foundation, Oxford University and other bodies last year, picking up on The Lancet’s report that the first clinical trial of gene therapy for choroideremia has shown better results than the researchers expected. It is one of several gene trials that have started changing the landscape for eye health research. Yet at the same time, there are quite a few other areas where gene therapy has been hailed as the solution without, to date, any tangible results. Can this route really end up changing the lives of people with inherited eye conditions? Every cell in the body (apart from sperm and egg cells) usually contains 23 pairs of chromosomes. These 46 chromosomes carry genes; and genes are made up of Deoxyribo Nucleic Acid (DNA), which carries the code that determines the body’s “instructions”. The genetic material can go wrong in numerous different ways. Sometimes a single gene becomes abnormal, quite spontaneously – and once that gene has malfunctioned, it can be inherited. Whether spontaneous or inherited, if there is a mistake in the code, the body is not able to function correctly. Those mistakes are then passed on, with different inheritance patterns giving different chances of a child developing the disease. In addition, some conditions are the result of a whole chromosome being wrongly arranged. And to make the whole issue even more complicated, genes can mutate in different ways, yet result in the same syndrome or condition. The first step for the researchers is to identify the gene that is associated with a specific condition: first in the laboratory and then in the tissue of the human body. Following that, they can start thinking about ways to correct the disease-causing abnormality. It is sometimes possible to treat a genetic defect with drugs, which target the proteins and enzymes that genes produce. For instance, Dr Maria Moosajee at UCL is looking at pharmacological ways to suppress “nonsense” mutations. “These are single nucleotide changes in our genes – usually inherited but sometimes sporadic – that change one of the amino acids into a premature stop signal, which means when the cell is trying to produce protein, it hits the signal and doesn’t make a proper full-length functional protein,” she says. At other times, it is possible to target the defects at the level of the genes’ actual DNA. “Genes are introduced into specific cells of the body – in this case, specific cells in the eye – and are not passed onto the next generation,” explains Dr Robin Ali, who is the Professor of Human Molecular Genetics at the Institute of Ophthalmology at University College London. This type of therapy takes two main approaches. The first is to replace a gene that is either missing or faulty in conditions where that specific gene defect is mainly or solely responsible for the condition. The other approach alters other genes in the area – in a manner that either slows the course of a disease or provides some form of protection from its effects. However, the breakthrough has been in the way the gene actually gets into the tissues, explains Professor James Bainbridge of Moorfields and UCL. Injecting it means the delivery is very targeted, and there is minimal exposure to the other systems, but it still has to be conveyed in a “vector” to get into the cells. “One of the challenges is to deliver the gene to the cells that require it with the efficiency we need,” he says. “Most of the current trials are viral vectors, because these are currently considered to be the most efficient. Viruses are highly evolved to deliver genes, so we’re exploiting their evolutionary design to give us the most efficient vehicle. “There are alternatives, based on encapsulating genes in coats that are not viruses. But at the moment, these are less efficient at delivering the gene. They are injected directly into the eye, offering a very targeted delivery with minimal exposure to other systems.” The route he and many colleagues are using is “adeno-associated virus” (AAV). So where is this getting us in practice? A couple of the much-publicised trials – including Robert MacLaren's, who is Professor of Ophthalmology at the University of Oxford – are definitely starting to show some result; the choroideremia patients have actually had some improvement in their vision because although the therapy cannot restore dead cells, it can restore the function of ones that are still there. “The early results we saw at six months have been sustained at two years,” says MacLaren, who now has the funding for a phase 2 trial and to start the approval process for the therapy. Bainbridge adds an update on the UCL trial for Leber’s Congenital Amaurosis, which has had a lot of coverage. “Children with this condition have some daylight vision, but no night (rod-based) vision. As they get older, they lose the daylight (cone-based) vision. We are excited to find that gene therapy can improve night vision, and we will shortly be reporting on the longer-term impact in our study. Looking forward, Bainbridge and his colleagues now have MRC funding for a trial of gene therapy for congenital achromatopsia. “There are several trials ongoing around the world using gene replacement therapy and tackling deletions like AMD and diseases of the optic nerve,” adds MacLaren. Most of this work at the moment still focuses on replacing a single faulty gene with another – although a number of trials tackling AMD also aim rather to use gene therapy to deliver treatments, rather than “correct” a fault. “We’re choosing in the first instance conditions that most likely will give us the most rapid indications of outcome,” Bainbridge explains. Another huge step forward will be when the researchers can develop therapies for conditions that are more common, but will require trials that take longer to demonstrate their results. So is gene therapy the route forward to a cure for some eye conditions? There is a long way to go – and everyone involved stresses this, since at the moment, many trials are still at the level of proving that there is a link, or that there is no danger to the patients. Yet the work that hit the headlines a few years ago has gone from strength to strength – and that is hugely encouraging.